The Novotný family established their stable in Dolní Chabry in 2003. They built four box stalls on the land featuring an orchard, a natural spring, and an old barn for their horses that were at the time stabled in a place called Kytín-Rovina. Jakub, sixteen years old at the time, was a keen rider with horses stabled in different equestrian centers close to his home. He had always had a clear idea of what horse care and facilities he wanted. Since he was unable to find a place that would meet his requirements, he decided to establish, with the help of his family, his own stable. 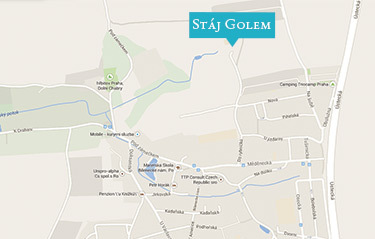 His father’s catering company Golem was Jakub’s main benefactor during his whole career, therefore, it didn’t take long to find the right name for the Stable.